Day to day life, one crafting adventure at a time. November already! Is anyone else finding they blink and a whole month has gone? We’re getting scarily close to Christmas now! I hope you’ve all had a good few months – sorry I missed my monthly goals again in October! I was only getting round to updating my goals by the middle of the month so I decided to hold off a couple of weeks so that it lined up with the beginning of the month again! Hopefully things will get back on track now! Anyway, here is the summary of how I faired with my September goals, and the goals I am setting for the month of November. Enjoy! Once Upon A Time Sampler – I had really hoped to get that banner in but I have been so off cross stitching recently…I think the Barcelona Sunset took it out of me! At the minute I am just about keeping up with the monthly designs (not that it was finished when I took the photo but it is now, I promise!) which isn’t too bad, if the banner has to be added as a late addition then so be it! Blimey, where are the weeks going??? Once again, we are in the middle of the month before my goals are going up and it’s been four weeks since my last post again! Time seems to be galloping ahead without me at the moment but I’m desperately trying to rein it in and get posts up more frequently! But for the meantime, here are the outcomes of my August goals, and the goals I have set myself for September. 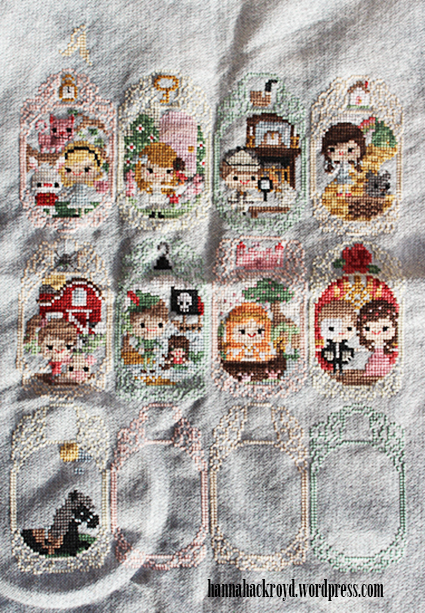 Once Upon a Time Sampler – In August my aim was to get the two remaining frames stitched in as well as the design for the month and I completed this so I was thrilled that it is almost up to date! I even managed to make a tiny start on the banner at the top…can you see it? Also, a sneak peek of the September design there too – this month is Black Beauty! 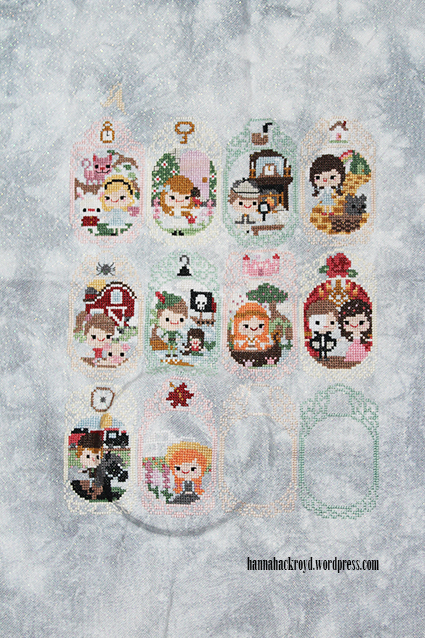 Once Upon a Time Sampler – This one was a success! I managed to get the frames for June and July filled in with no problems…it stitched up really quickly! I do love working on the little design each month to give me a break from my bigger projects! 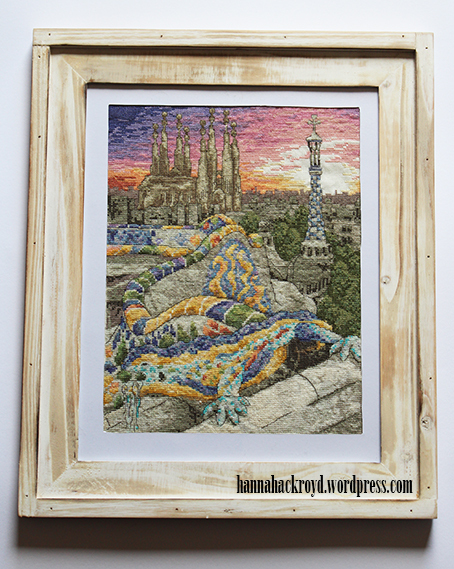 Barcelona Sunset – My aim for June was to finish stitching the lizard (achieved!) and to stitch half of the wall (not achieved.) 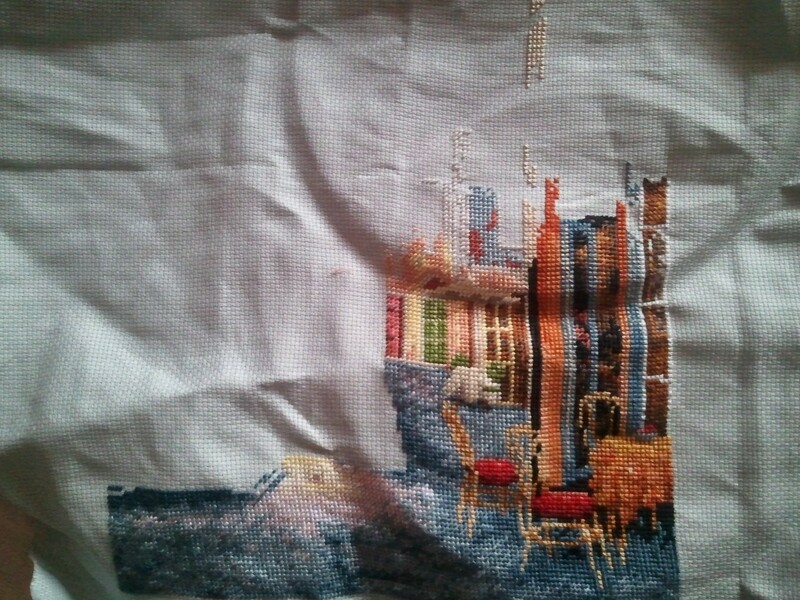 However, although I didn’t get the wall stitched in, I did make a start on the backstitch. I know, I always go on about how much I hate backstitch! But in comparison to stitching the solid grey mass of the wall, backstitch seemed favourable! I have completed three quarters of the backstich for the whole project now which is really spurring me one! So I didn’t completely achieve the goal in June, but I did beat my overall target for the project (to finish by the end of August) by finishing it at the end of July! I never thought I’d see the end of it but I am thrilled with the result! I hope you’re all doing well 🙂 I can’t believe June is here already! Where is 2015 going??? Almost half way there already! Anyway, here is the roundup of my May goals so you can see how I did, as well as my goal setting for June – these lists seem to be growing and growing! 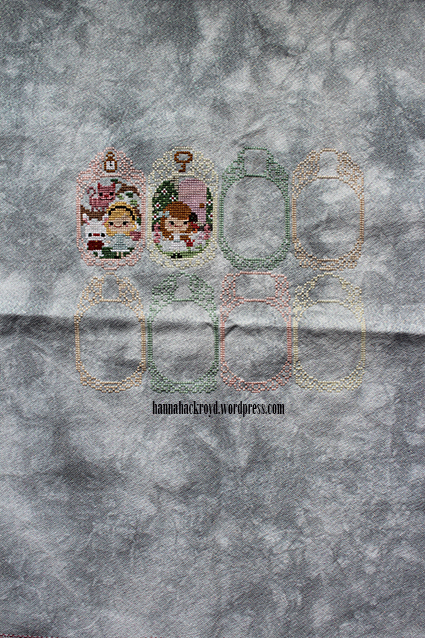 Once Upon a Time Sampler – In May my aim was just to fill in the square for that month and I managed that without any problems. I seem to fly through these at the beginning of each month then it gets shelved and almost forgotten until the next month comes round! It’s a shame because it is such a lovely project and I do want to dedicate more time to it to get all of the extra elements in but until the Barcelona Sunset is out of the way it will have to wait! Last month I set myself some monthly goals to try and achieve everything that I wanted to in March. By setting myself the deadline of the end of the month I hoped that I would feel motivated to complete everything on my list to get it all done. Overall it didn’t pan out quite as I had hoped! However, I’m not going to let that put me off setting monthly goals; here I have written a summary of how my March goals worked out (or didn’t!) and what I want to achieve in the month of April. Hopefully although I didn’t get as much done as I was hoping to last month, I will still be able to achieve big things this month! 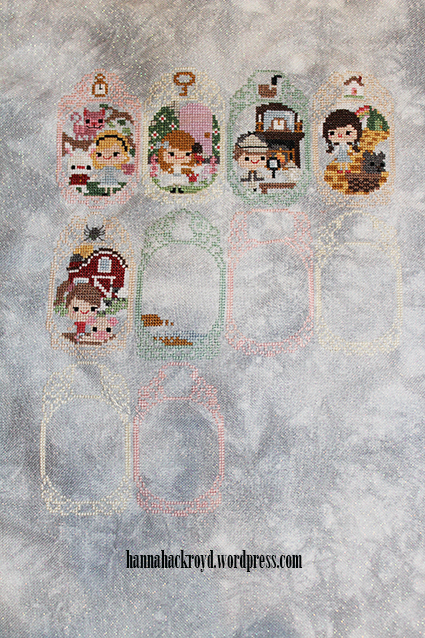 Once Upon A Time Sampler – Last month I set myself the goal of stitching the four remaining frames on the bottom of the sampler. Unfortunately I didn’t get all four done but I did manage two so that it something! Easter Weekend also spurred on my productivity with this project as I dedicated it to stitching this month’s design so I feel like I am off to a good start with this one in April, even though I didn’t manage to do everything I wanted to with it in March. Writing my 23 Before 23 Review last week has got me motivated to set some goals for myself. I’m the kind of person who works much better if I have a deadline and I am super productive if I set myself a challenge. I have set myself some long term goals to achieve this year which I will blog about shortly, but I have also decided to set myself some shorter monthly goals too. These monthly goals will sometimes be ones that help the general progress towards my long term goals, or will otherwise just be shorter goals or jobs that I want to complete before the end of the month. I have tried to pick a range of goals from different areas of my life such as crafts, reading, fitness and blogging, to help inspire me to achieve everything that I want to achieve by breaking it down to regular milestones each month. 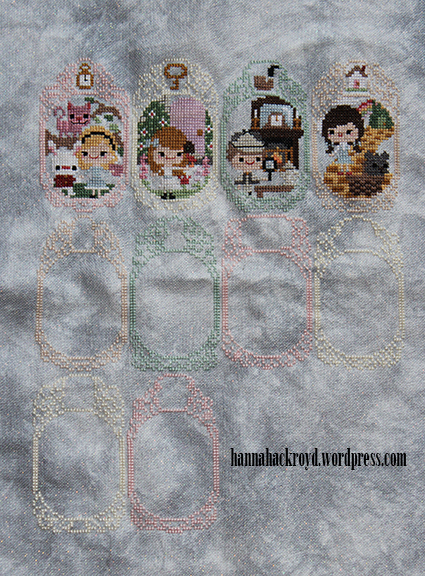 Once Upon A Time Sampler – So far I have been making good progress with my sampler and keeping up with each month well. This month I want to stay on track and complete the design, I also want to add the bottom row of 4 frames which I am still yet to add. So far I have stitched the first 8 frames, so if I can add the last of the frames this month, it only leaves me the banner at the top to complete at a later date ,then I am definitely on track to complete each design per month! If I can keep up with my plans, this will be the first year that I don’t have to play catch up…fingers crossed anyway! I finally have a finished stitching project! Sorry everything has been pretty inconsistent here recently, the stress of my final semester of university has been catching up with me and I have got pretty run down and ill on and off the last few weeks so my blogging (as well as everything else in life at the moment) has been suffering. I have just over two weeks until my three week Easter holiday from university which will hopefully give me a nice break (as soon as I have done the reading and the three essays that need to be done for the week I go back!) So if there are some gaps in my blogging over the next few weeks I’m probably having some ‘me’ time to try and stop myself from going insane or developing another illness – or I’m just catching up on sleep! 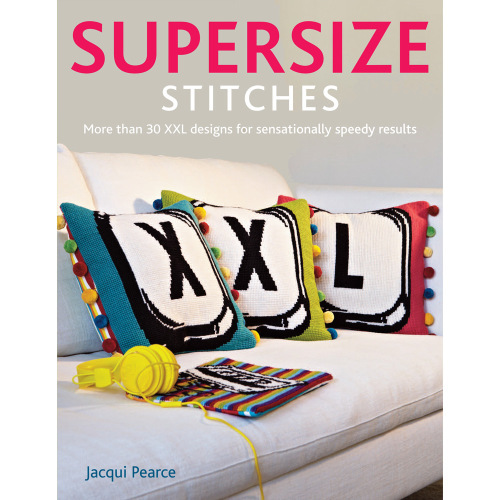 I stumbled upon Jacqui Pearce’s blog a few months ago and I instantly fell in love with her designs for Cross Stitcher Magazine. When I heard that she had a book coming out, I knew that I had to buy it! 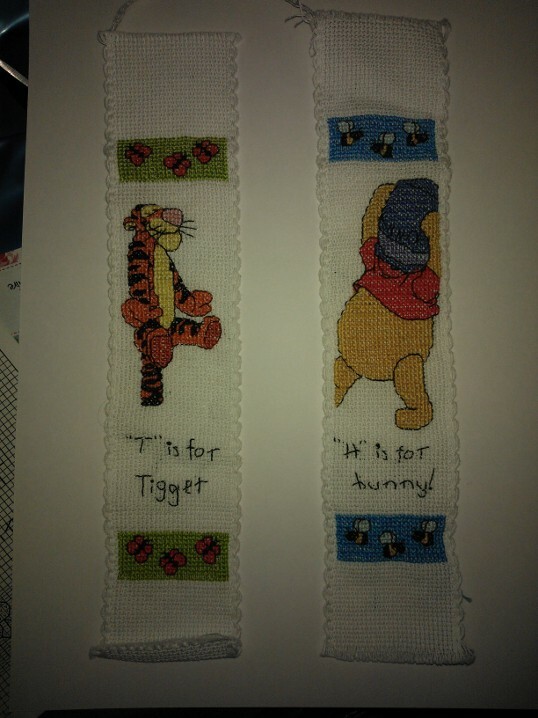 As usual, I have fallen behind with my stitching as well as my updates! I find that I keep going through phases when I feel really motivated and make a lot of progress on my Dimensions Gold kit, then I have a week where I really can’t face it! Sadly, last week was one of those ‘I-can’t-be-bothered’ weeks. However, I have made plenty of progress in the previous week to share with you! As you can see (excusing the hoop marks!) I have completed the pavement on the left half of the chart! I am now working my way up the centre and filling in the buildings in the background, before working on the foreground building on the left hand side. The next goal is to reach the top of the design!